Lake Waramaug is known near and far as one of the jewels in this area. Sean Hayden, LWTF Executive Director, will deliver a visual presentation and highlight all that the Task Force has done, is doing and planning to do to protect and improve the water quality of the lake. Topics of discussions include: The In-Lake Layer Aeration System, Water Quality Sampling, the Zooplankton Farm on Arrow Point, Trout Stocking and its effect on the health of the lake, Construction Inspections, Site Plan Reviews, Agricultural Land Management Assistance, Environmental Education and Outreach, the Aquatic Invasive Weed Eradication Program and so much more. The event will be held on August 9, 2018 at 6:30PM. It is free and will be held at the Gunn Memorial Library, 5 Wykeham Road, Washington CT. Registration is requested. We cannot keep Lake Waramaug clear, clean, and swimmable without you. The exclusive mission of the Lake Waramaug Task Force is to maintain the water quality of the Lake. 50 years ago, prior to the formation of the Task Force, Waramaug was effectively dead. Today, with the benefit of your steadfast support, the Lake is again alive and beautiful. But we must not let down our guard. Dear Friends of Lake Waramaug - Congratulations! Your commitment to Lake Waramaug shows. This summer our beautiful Lake sparkled. Swimmers, boaters, water-skiers, kayakers, paddleboarders, campers, fisher-people... all enjoyed the benefits of your ongoing support: Waramaug’s clean, clear, swimmable water. For the Lake Waramaug Task Force this was not only a beautiful summer, it was also a busy summer. We welcomed Sean Hayden aboard as our new Executive Director. Sean was out on the Lake almost every day coordinating water quality testing, surveying for invasive weeds, making sure our in-lake aeration system kept working, overseeing the feeding and release of Zooplankton from our incubators tanks on Arrow Point, inspecting stormwater culverts and construction activities along the shoreline, consulting with our lake scientists and assisting landowners on lake-friendly ways to landscape within the Lake Waramaug watershed. Phew! The Lake Waramaug Task Force has been around for 40+ years. It is a non-profit scientific and educational organization dedicated to restoring and maintaining the ecology and water quality of Lake Waramaug and its watershed. The Task Force spearheaded the turnaround of the Lake beginning in 1975, and has been on the job ever since. Our Lake is clean, and the water quality is vastly better today because of the Task Force’s vigilance. But the job is not done. We must address each of the following five challenges if we hope to continue to keep the Lake clean and healthy. Read more here. An example of the important work effected by LWTF are the erosion repairs at Sucker Brook, a stream responsible for an estimated 50% of the Lake's water inflow. Over the years, several sites have developed where the stream curves that have washed away much of the soil bank, undermining trees (and, in one location, State Route 45) and depositing tons of silt into the Lake. Read about the LWTF repair project here. After many years of “only in your dreams” work with the Task Force I am retiring. I would like to express my deepest appreciation for everyone who has contributed time, funds and moral support for the mission of the Task Force over the past 43 years. The current and all past members of the Board, the First Selectmen of the three towns on the Lake Waramaug Interlocal Commission, Lake Waramaug Association and Lake Authority. Maintaining good working relationships with these organizations, the town land use boards and local land trusts has been and will continue to be crucial to the success of the Task Force. Special thanks to our outstanding team of lake science advisors - our long time highly decorated lake research and development guru Dr. Robert Kortmann and his staff at Ecosystems Consulting Services, our invasive plant specialist Dr. George Knoecklein and our plant removal diving team under Matt Vogt. Also to the clerical and bookkeeping staff, especially Lois Pinney, and Hank Vallely who, with his assistance, have since 1999 carefully inspected all motor boats entering the lake for invasive plants. Waramaug continues to enjoy improving water quality solely due to all the lake saving work we have done every year for so long. This work must continue and it must remain as it has been - ahead of the curve. All the very best to everyone. And here’s to the continued health and wellbeing of Lake Waramaug. The Lake Waramaug Task Force has been honored by The Garden Club of America! 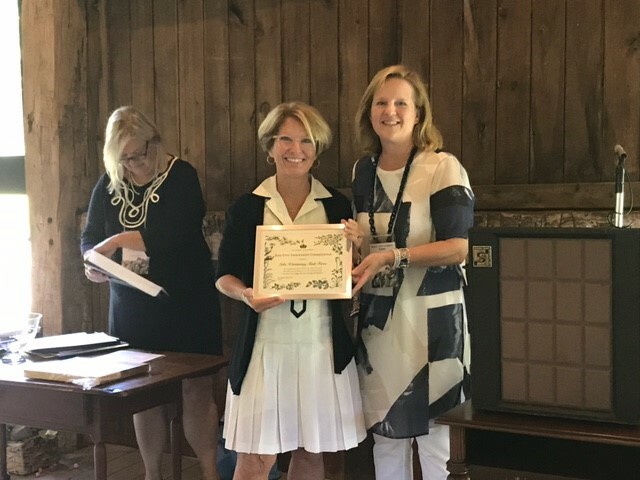 We received the GCA’s award for “The Lake Waramaug Task Force’s dedicated commitment to a restoration program to maintain the ecology and water quality for the future.” LWTF Chair Molly Butler Hart accepted the award from Karen Marche, GCA Conservation Committee, Zone II Representative at a luncheon at Hollister House. Kudos to all those who have supported the Task Force over the years. This prestigious award is yours as well as ours. Welcome to another season at Lake Waramaug. It was a busy winter for members of the Lake Waramaug Task Force…and we are looking at an equally busy and critical summer ahead. The Task Force continues to move ahead to control the many soil erosion sites on Sucker Brook and other smaller streams that are harming the lake’s ecology. Storm water conveyed soil deposits from these erosion sites are creating deltas at stream and culvert inlets. These deltas rob the lake depths of the vital cold, well oxygenated water Lake Waramaug needs to stay healthy. They also create ideal habitats for invasive aquatic plants. On Potash Brook, which runs to the lake from above the Hopkins Vineyard, we have permits in place to stabilize a stream bank erosion site and clean out eroded soil from an in-stream collection basin. Another soil full sediment basin on Hawes Brook in Warren is also permitted to be cleaned out in 2017. The Lake Waramaug Task Force's cutting-edge project to cultivate Zooplankton in the former aeration facility on Arrow Point is now operational. Modifications to the basins have been made and the microscopic organisms have been introduced. The initiative has been funded in part by start-up grants from the Ellen Knowles Harcourt Foundation (see below) and the Marion Wm. and Alice Edwards Fund, a fund of the Community Foundation of Northwest Connecticut. Additional funding was obtained through participation in the Give Local campaign in May. Zooplankton are microscopic-sized aquatic animals that have been shown to be important in controlling algae populations in lakes. Although natural to Lake Waramaug, the zooplankton population was significantly diminished by the introduction of the alewife, a non-native fish, to the waters in the 1960s. The alewife feeds on zooplankton, and the upsetting of the natural ecological balance resulted in larger and more frequent algae blooms in the 1980s. LWTF's chief limnologist Dr. Robert Kortmann pouring a seed batch of zooplankton into the newly modified "Zoo-P Farm" facility on Arrow Point. Lake Waramaug's currentdrought-reduced water level had one positive effect: allowing engineers to begin survey work on the dam at the New Preston end of the lake which releases water into the East Aspectuck River. Necessary repairs and imporovements to the dam have been in disucssion for some time. It is estimated that all permits, drawings and specifications will be completed this fall so that bidding on the acutal construction can be done. That work is expected to begin in the spring or summer of 2017. The Lake Waramaug Dam, owned by the Town of Washington, uses a pipe and gate system to control water flow and the lake's water level. Its aging technology has made it difficult to execute those adjustments. Although Connecticut keeps records of over 4,000 dams statewide, responsibility for inspection and repair has been shifted to the owners, as detailed in a new Dam Safety Regulation that took effect in February. Although safety issues such as flood control, fire protection and safe boating are the primary considerations for dam maintenance, management of the water level is also a vital tool for water quality control. Low levels create a favorable condition for the growth of invasive weeds and cyanobacteria (blue-green algae), prevent the emigration from the lake of the harmful alewife population and inhibit the natural surface skimming of dead and dying organic material. Consequently, the Task Force has been active in encouraging the dam improvement project. The Town of Washington has budgeted $50,000 for the engineering phase of the project and another $50,000 for construction. Note: An interesting history of the Lake Waramaug Dam appears in the Lake Waramaug Association's May 2016 newsletter. "Waramaug's Unique Outlet - An Historical Perspective on Our Dam."